Get out of the office and come to the workshop! At the DICTUM workshop Kurswerkstatt München we have adapted our handicraft courses to suit the urban life style. In after-work classes or semester courses the participants learn how to handle machine tools and employ their new knowledge in project courses. How do electrical tools work and how are they properly handled? How do you use stationary woodworking machines properly and safely? How can I design, plan, and build my own furniture? Which materials and fittings will I need and how are they properly worked with? How is a WoodRat or a router properly used? How are hand tools used in classic wood joinery? How are hand tools and knives sharpened properly? The premises are divided into two well-equipped workshops: a bench workshop and a machine workshop. You will find nearly all classic hand tools in adequate numbers. You can try out all tools in the DICTUM Kurswerkstatt München and purchase them on the premises. It is also possible to use the workshops and machines of the Kurswerkstatt at hourly rates for your own projects. Conveniently located in the immediate vicinity of the Munich station "Ostbahnhof". You can easily reach us by public transit with the MVV. 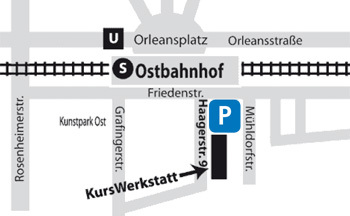 If you come by U-Bahn, S-Bahn or TRAM, please use the underground crossing under the station "Ostbahnhof" and take the exit "Friedenstraße". There is free reserved parking for you in the car park close by on the top storey, entrance D.